Few outside the glass-casting arena know of my mentor, Hugh McKay, as he too works in relative isolation. McKay runs a glass-casting foundry called Cast Glass Forms on the outskirts of Spencer, Iowa. Originally from Gold Beach, Oregon, McKay was once a frequent poster to the online forum at WarmGlass.com, through which I taught myself the science of casting. 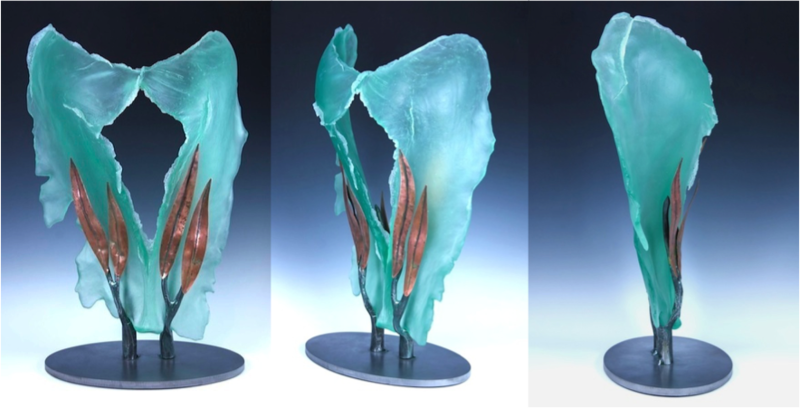 Cast Glass Forms creates finished glass sculptures from original art in any material. McKay has developed advanced investment shell techniques that greatly increase the odds for casting success. All of his different investment strategies reduce cold-working and produce better castings right out of the kiln. McKay’s application method of “sputtering” thin coats of heat-resistant plasters onto a wax model is ingenious, as is his “sand can” method for casting especially thin glass pieces. As far as I know, McKay has never taught in a physical classroom, and he rarely, if ever, posted photos of his process online. But I was so intent on learning from him that I purchased every product he suggested and tried to imagine his process. Eventually McKay stopped posting on the Warm Glass discussion board, so I sent him direct emails, instead! He responded thoughtfully to each of my questions and made a lifelong fan of me. McKay’s advice is based on science that works, so I’ve never had reason to doubt his theories. In the spring of 2015, I ran into some casting problems that required advanced, immediate answers. I called McKay directly and he graciously suggested a visit to Cast Glass Forms. 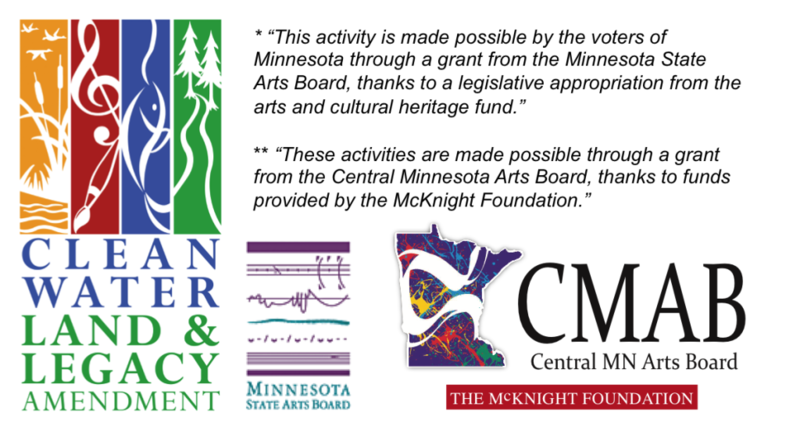 Coincidentally, I had just received a Career Development grant from the Central Minnesota Arts Board**, so I could afford to spend two full weeks at Cast Glass Forms, assisting McKay and his staff with a few special projects. 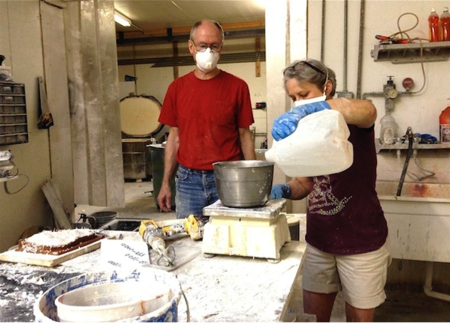 I jumped feet first into McKay’s studio routine, modeling wax and preparing rubber molds for plaster investment. I nervously completed my first “sputtered” mold under McKay’s watchful eye and found the process exhilarating. Four hours of nonstop “sputtering” coats the wax model in a dozen layers of thin, heat resistant plasters and fiberglass shorts. As with most glasswork, the key to successful production is precise timing, like a finely choreographed dance. There are no breaks in process until the investment shell is complete. When the wax form is sufficiently covered in plaster, a “can” of stainless steel mesh and refractory cement is built to conform around the plaster-invested model. The can is filled with a soft plaster/silica mix, or quartz sand for extremely fragile glasswork. Once cured, the entire mold is inverted to steam out the encased wax model and set in a kiln to dry. Glass or crystal billets are then loaded into a reservoir above the voided wax opening and the kiln processing begins. After cooling, the investment shell is removed and the resulting glass sculpture is carefully cleaned and finished using a variety of tools. In my next post, I’ll share photos and insights from my studio to illustrate the impact of McKay’s casting methods on my work this year. Please feel free to question or comment and I will do my best to respond. Thanks for following along in my journey!